There are only so many ways to reformat and recontextualize the various twists, turns, betrayals, and shock revelations that make up the detective genre. So the wise writer realizes that the detective must become just as memorable as the mystery, preferably even more so. And so the great detectives of fiction all have features that distinguish them from the masses of gumshoes, private dicks, and police inspectors: Philip Marlowe was a world-weary philosopher, Columbo an imaginary fool, and Sherlock Holmes a genius savant cocaine addict. So here we have Matthew Scudder, a New York City based private investigator courtesy of writer Lawrence Block. He is a recovered alcoholic. The first movie based on the character, Hal Ashby’s unjustly maligned 8 Million Ways to Die (1986), focused on his struggles to stay sober with the help of Alcoholics Anonymous. Boasting a script by Oliver Stone, the movie mimics his earlier screenplay for Brian De Palma’s Scarface (1983) with its obsession on appearances, conspicuous consumption, and larger-than-life, almost cartoonish personalities. 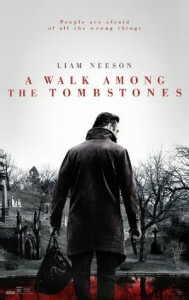 But Scott Frank’s A Walk Among the Tombstones takes place years after Scudder’s recovery. Divorced, fired from the NYPD after accidentally killing a bystander during a shoot-out, and tired, Liam Neeson’s performance as Scudder is as emotionally exhausted and weary as Jeff Bridges’ Scudder in 8 Million Ways to Die was charming. Frank’s direction and Mihai Malaimare Jr.’s cinematography create a world as bleak and dreary as Scudder’s private life. Perpetually overcast, the streets of New York City seem drenched and soggy with a rain that never quite makes it onscreen until the end. A subdued color palette drains all of the life from the characters and buildings, with the exception of one notable explosion of the color red that marks a young girl as a target doomed for kidnapping. The film demonstrates an acute awareness of place, frequently framing its characters in interior static two- and three-shots and exterior long shots that watch the characters move from one side of the frame to the other. In doing so, the filmmakers manage to portray New York City as a setting that the characters inhabit and not the other way around (as is common in so many films set in prominent cities). Despite its intensity, 8 Million Ways to Die gains a certain retrospective camp value with its focus on Hispanic drug dealers and wide-eyed hookers. But A Walk Among the Tombstones is not interested in a simple story of good guys versus bad guys. Instead, it attempts to grapple with the nature of Evil, with a capital “e.” Scudder is hired by a wealthy drug dealer who wants him to locate two men who kidnapped his wife and returned her to him in small chunks even after he paid them the ransom. Upon investigating, Scudder discovers that these two men are serial killers who seem intent on punishing drug dealers by kidnapping their loved ones and gleefully chopping them into tiny pieces while still conscious. These aren’t criminals who want or need money, they are criminals with an agenda, and therefore are even more dangerous. Even more interesting, Scudder doesn’t seem particularly interested in justice with a lower case “j.” He has no problem working with drug dealers and breaking-and-entering in order to get evidence. Even when he makes contact with the kidnappers in the film’s last act, he never seems motivated by righteous fury but instead by… disgust? Annoyance? It’s difficult to say. Frank wisely introduced an element into the film that helped humanize Scudder: a homeless black teenager named TJ (played with astonishing honesty by Brian Bradley) who becomes Scudder’s “associate” after discovering him in a public library. Their mentor-like relationship is not motivated by love or compassion, but instead by need. Scudder provides a direction and purpose in TJ’s life. And TJ? Maybe he provides Scudder with something he hasn’t felt in years: the sense that somebody is choosing to rely on him. Previous ArticleAudio Interview: Dylan O'Brien, Will Poulter & Kaya Scodelario! Next ArticleTV Review: Outlander 1x07 - "The Wedding"